Designed by Nicolette de Waart for Design by Nico, the Corian writing desk is an intriguing mix of two materials. Says Nicolette, “My aim was to play with contrasts. On the one hand, you have the clean, solid surface of super-tough Corian, on the other, the warm touch of oak”. Beautifully made by British craftsmen, the desk not only looks elegantly minimalistic, it also functions beautifully and will last a lifetime, if not longer. 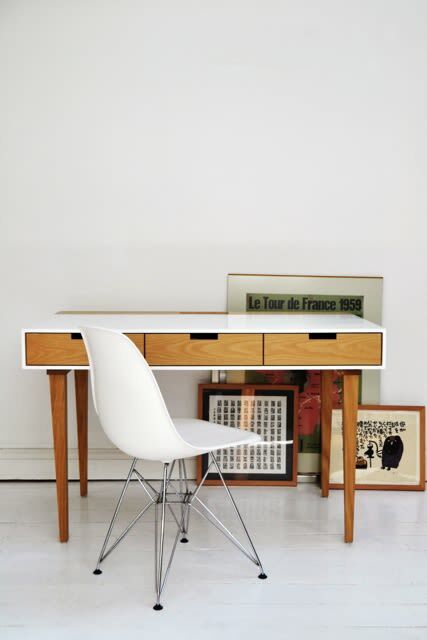 The desk can be made in a choice of either black or white, with straight or flared legs, and works equally well at home or in the office.